Singing is a part of virtually every culture and is fundamental to our human experience. In the United States, singing is enormously popular, as evidenced by the vast number of people engaged in all kinds of singing activities. Over 30 million Americans participate in choral singing alone (Chorus America, 2009). Shows like The Voice, America’s Got Talent and American Idol illustrate how passionate we are about singing. From the amateur recreational singer to the elite celebrity, we sing as soloists and in ensembles, with instruments and a cappella, in classical and contemporary styles, on stage, in concert and in the shower. Every person’s voice is unique and identifiable, and our voices can be a big part of our identity and how we see ourselves in the world. This is especially true for singers, for whom the voice is not only intricately tied to self-image and self-esteem, but also may be a source of income and livelihood, creative expression, spiritual engagement, and quality of life. For a singer, a voice injury represents a crisis. Because of the specialized needs of singers, it takes a team—including a laryngologist, speech-language pathologist, and singing voice rehabilitation specialist—to get a singer back on track following an injury or voice disorder. Singing voice rehabilitation is a hybrid profession, requiring in-depth clinical and scientific knowledge married with excellence in teaching singing. Voice problems are rarely isolated in etiology—usually, multiple factors converge to create an injury. These factors may include poor vocal hygiene, inadequate vocal technique, an imbalance in vocal load and medical problems (allergies and reflux are common in singers, but thyroid, pulmonary, neurological and rheumatologic conditions are among the illnesses that may affect the voice). 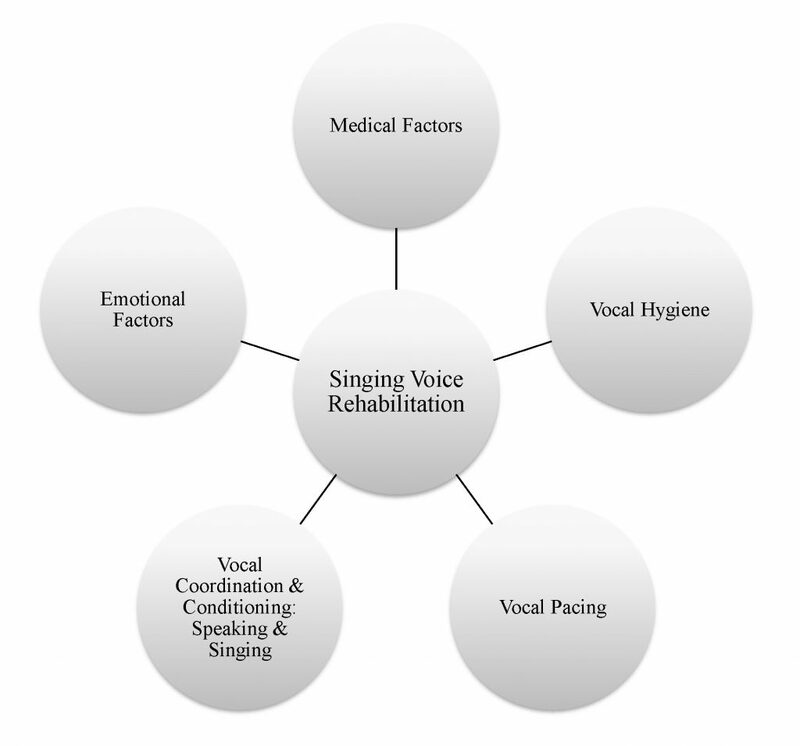 The singing voice rehabilitation process must encompass all elements that may be contributing to the problem: medical factors, vocal hygiene, vocal coordination and conditioning, vocal pacing, and emotional factors. In the context of voice rehabilitation, the singer’s vocal technique may have contributed to the voice problem and/or may be compromised by the voice injury. In many cases (particularly for CCM singers), the singer may have never received formal training or may have been trained with a classical methodology that does not align with his or her singing style (LoVetri & Weekly, 2003; Weekly & LoVetri, 2009). The singing voice rehabilitation specialist must design a rehabilitation exercise protocol that promotes optimal coordination of voicing subsystems to appropriately compensate for and promote resolution of the injury while ensuring the singer achieves and maintains adequate vocal conditioning, all in a manner that is consistent with the physiological and acoustic characteristics of the singer’s style. Thus, the exercise regimen for a rock singer will be different than for an operatic singer. An effective singing rehabilitation design goes far beyond what is necessary for building technique in a healthy instrument—it requires deep scientific and clinical knowledge to understand the differential impact of various vocal injuries on the structure, function and interaction of voicing subsystems. The rehabilitation protocol must be customized to singing style and underlying injury. The difference in the exercise regimen for a singer with vocal nodules vs. vocal fold atrophy may be subtle but can have significant impact on the successful outcome of the intervention. While thorough scientific and clinical preparation is indispensable, it is equally important that the singing voice rehabilitation specialist be an accomplished teacher of singing. One must be competent in training healthy singers before delving into the more complex endeavour of interacting with an injured instrument (NCVS, 2013). Ideally, the vocal exercise regimen should encompass the voice holistically—both speaking and singing. Prioritizing vocal activities and unloading or reducing those that are less important. Documenting voice use to identify where the vocal load is out of balance and where there are opportunities for improving balance. Planning amount and intensity of voice use in advance, scheduling periods of voice rest (especially when rehearsal and performance demands are high) and strategic planning for efficient practice time. Effective use of amplification, both for singing and speaking. In some cases, optimizing vocal pacing may mean increasing voice use on a day-to-day basis to “smooth out” the overall vocal load, as for the “weekend warrior” in a garage band or choral singer preparing for a concert. In either situation, the singer may be engaging in extremely intense voice use episodically without getting regular vocal exercise in between. Many singers have a strong emotional reaction to experiencing a voice problem which arises not only out of concern about the implications for continuing performing but due to long-held and misguided beliefs in the singing culture that voice injuries are the fault of the singer and that singers who experience voice problems are “damaged goods.” The singer may undergo emotional ups and downs throughout the rehabilitation process, especially if performance has been curtailed or when financial or academic success is jeopardized by the voice problem. In addition to the physical injury, many singers sustain an “injury of confidence” that can linger after the injury has resolved. Throughout the rehabilitation process, the singing voice rehabilitation specialist must be mindful of and sensitive to the emotional experience of the singer and interact in a compassionate and supportive manner. All of these factors—medical, behavioural and emotional—must be appropriately addressed through collaboration of the voice care team to guide the singer back to a state of vocal health and wellbeing. Obviously, singing voice rehabilitation is a complex and multi-faceted process, requiring knowledge and experience that span art and science. Manual of Singing Voice Rehabilitation: A Practical Approach to Vocal Health and Wellness has been developed to guide the singing voice rehabilitation specialist in developing and executing effective, efficient rehabilitation plans that are customized to each individual singer, encompassing all relevant factors, so that singers are empowered to return to a state of vocal wellness and the joy of singing. Originally published in the Plural Publishing Community Newsletter, April 2016. Leda combines her extensive performance experience as a classical Soprano with her roles as a speech-language pathologist and voice teacher. She has worked as a voice teacher for over 30 years, serving on the artist faculties of Bowling Green State University, Meredith College, Brigham Young University of Hawaii and the University of Southern Maine. In 2004, she obtained a Master of Science degree in Speech-Language Pathology from Boston University. As a graduate SLP student, she completed an internship in voice disorders and voice rehabilitation for the performing voice at the Massachusetts Eye and Ear Infirmary in Boston. 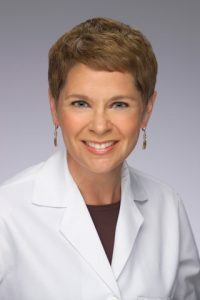 She is currently Clinical Singing Voice Specialist, Clinical Associate Faculty and Director of Performing Voice Programs and Development at the Duke Voice Care Center and Duke University School of Medicine, where she provides rehabilitation therapy to singers, actors and other vocal performers with voice injuries. 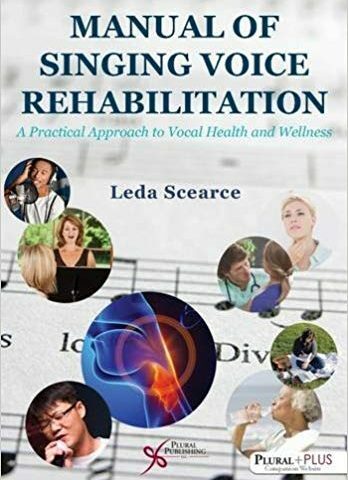 Leda is the author of Singing Voice Rehabilitation: A Practical Approach to Vocal Health and Wellness, published by Plural, Inc.
LoVetri, J., & Weekly, E. M. (2003). Contemporary commercial music (CCM) survey: Who’s teaching what in non-classical music. Journal of Voice, 17(2), 207–215. Weekly, E. M., & LoVetri, J. (2009). Follow-up contemporary commercial music (CCM) survey: Who’s teaching what in non-classical music. Journal of Voice, 23(3), 367–375.